We're your big friendly personal and business storage company. That means we offer you flexible, low cost, accessible space to store your stuff for as long as you like. At Lok’nStore, you’ll find the right self storage solution for you - we guarantee it. In 1995 we were one of the first self storage companies in the UK. Now we have over 27 stores in handy locations across the South East of England. At each one you'll find a huge range of self storage units to choose from and a friendly team ready to help you out with storage tips and offer you a cuppa. Become one of our 7,000 customers and, like them, you can store your stuff in fully enclosed secure units. You can enter your storage units freely during business hours and control access with your own locks. For added peace of mind, all our sites have 24-hour security systems. To make storage straightforward, you get free use of our trolleys and our forklift trucks with qualified operators. 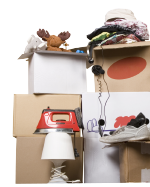 You can also get extra services such as insurance and vehicle rental - plus all the boxes and packaging you need. But what really sets us apart is our people. They're the secret behind the friendliest, most helpful storage you can choose. So why not find your nearest store and say hello? Personal, household and business self storage is available at all Lok'nStore locations: Aldershot, Ashford, Basingstoke, Bristol, Broadstairs, Chichester, Crawley, Crayford, Eastbourne, Fareham, Farnborough, Gillingham, Harlow, Hemel Hempstead, Horsham, Luton, Maidenhead, Milton Keynes, Northampton Central, Northampton Riverside, Poole, Portsmouth, Reading, Southampton, Staines, Sunbury, Swindon, Tonbridge, Wellingborough and Woking.